Comedian Nathan Fielder speaks to the press about his Dumb Starbucks Coffee satire project in 2014. In Malcolm Gladwell’s podcast “Revisionist History (season 1, episode 10),” the New Yorker columnist and New York Times best-selling author covers the topic of satire. According to Merriam-Webster, satire is “trenchant wit, irony, or sarcasm used to expose and discredit vice or folly." Satire is inherently pointed at someone specific. It is a way to express an opinion by tearing down a social or political construct. Gladwell asserts that the main issue with modern satire is that it isn’t polarizing enough. Modern satirical art is presented in a way that allows people from both ends of a debate to perceive it as representative of their own beliefs. For instance, Gladwell mentions Stephen Colbert’s character from The Colbert Report. In the 2009 study, The Irony of Satire, Political Ideology and the Motivation to See What You Want to See in The Colbert Report, Ohio State Communications scholar and Co-Author Heather LaMarre examined The Colbert Report for its political ambiguity and appeal to both sides. She found that liberals believed the show was a satire of conservative values, and conservatives welcomed it as reflective of their beliefs, believing Colbert only pretended to be funny, aligning with their political beliefs. The massively popular, aggressive and conservative character of Steven Colbert didn’t necessarily achieve its intended social change. That can be counterproductive for comedians trying to be persuasive, however, Colbert’s formula is tried and true when it comes to getting exposure. South Park is another popular TV show capitalizing on both sides of the political debate. Their vague political stances nurture communities of passionate, vocal fans from opposite ends of the political spectrum. In the current social media landscape, many companies have successfully entered the ring as creators of social commentary. For example, Wendy’s has become a viral sensation on Twitter by insulting their competitors as well as their followers. The widespread success of this marketing campaign lies in the fact that Wendy’s jokes aren’t truly pointed at their competitors, or users, at all. As aggressive as it seems, their Twitter presence is a statement about the viral cultural phenomenon of “beefing,” in other words, a polarizing fight amongst peers. It’s a tongue-in-cheek nod to celebrity culture which sensationalizes when two famous people don’t get along (e.g., NWA vs. Ice Cube, Taylor Swift vs. Katy Perry, and, most recently, Pusha T vs. Drake). Wendy’s tweets directly mock McDonald’s and Burger King. They even released a mixtape to start a real world “rap beef” with their competitors. Why is this not perceived as defamation in a court of law? Let’s look at Comedy Central’s show Nathan for You. 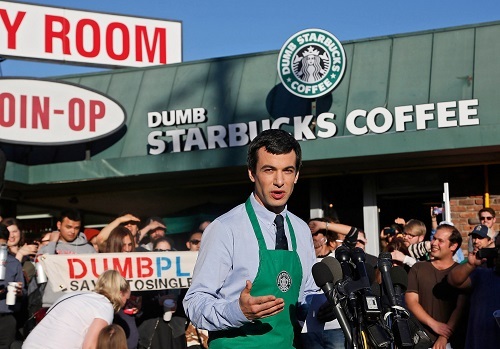 By making a satirical project out of starting a business, Nathan Fielder was able to open a coffee shop called “Dumb Starbucks.” He was able to keep the store open under the pretense that the entire shop was an art gallery, the coffee was part of the art, and customers were participants in the art and thus part of the piece as a whole. The trick to not getting in trouble is making something so outrageous that “no reasonable [person] could understand the publication as an assertion of fact.” For Fielder, part of that was proving he was already a known entity for making satire. The Onion and ClickHole are excellent examples of non-invasive satire. In a world of fake news and sensationalism, The Onion and ClickHole have consistently been perceived as satire. Their content is driven and protected by its inherent ridiculousness. That’s how satire law works. As tempting as it is to be a part of the buzz, the reality is that creating satire does not work for every brand. You can’t dabble in satire. If you decide to make sarcastic statements, that will become the personality of your brand. That is a persona that you are going to take on, and it has to work within the context of your positioning. There are 12 brand archetypes of companies, and only some of them should be attempting to make satire lest they hurt their image. For example, the brand archetype of McDonalds is “The Innocent,” thus they can’t act like Wendy’s, “The Regular Guy”. Any amount of a sarcastic angle would go directly against their branding. They have over 50 years of that innocence brand with happy meals, play places, and family values. The point of this post isn’t to convince you to make satire. The point is that you should make a marketing campaign with purpose. Put thought into what you want your consumers to walk away with. Give them something to think about and hold onto. As a brand, you want to make statements that go beyond regurgitating your audience’s already-cemented belief system.